"In Pichelin, basketball is not just a sport. It's a religion, passed down from one generation to another!" This is how Yannick Régis, a top basketball player of Pichelin, described the sport in his community. 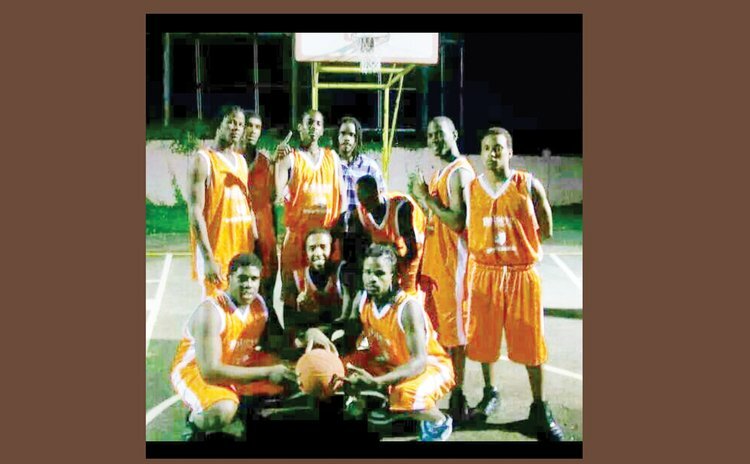 This southern village, which is traversed en route to or from Grand Bay – another of Dominica's "basketball centres" - has been involved in competitive basketball for about two and a half decades now. Pichelin has been represented in the national basketball league and in community leagues outside of the village. They have also staged their own "Off-Season" League, and players from the commnity have represented Dominica in regional or sub-regional basketball competitions here and overseas. Please have a court-side seat and view elements of Pichelin's basketball. From Pacers... to Pistons... to Falcons: Five (5) teams representing Pichelin have competed in the national basketball league over the quarter century since this village first got involved in competitive basketball. Edmund Williams Sr. recalls that the idea of forming a team to represent Pichelin in the national basketball league came about during a discussion which ensued one day, after he and some of the other young men from their village had taken their daily "sweat". The idea soon bore good fruit, and they named the team Pacers, after the Indiana Pacers of the NBA. Pichelin PACERS made their entry into the national league in the early 1990s, scoring their first points for the village. Pacers' founding members, and other pioneers who paved the way for Pichelin's basketball, include Levi Baron, Cleveland Bellot, Stephen Blaize, Ted "Shaba" George, Kent Henderson, McPherson "Mou-Mou" Henderson – a hearing-impaired player, Ben Jno. Jules, Jason Jno. Jules, Greg "Nadou" Letang, Jan Letang, Norman Régis, Virgo Registe, Romeo Robinson and Edmund Williams Sr.
Moses Raphael and Mervin Lloyd from neighboring Bellevue Chopin also played with Pacers in the 1990s. No team from Pichelin participated in the national league in 1997 or 1998. However, a team named Falcons competed in the 1997 league but they did not originate in Pichelin. Those Falcons were the second team to be so named in Dominica's basketball, the first having bounced onto the local basketball scene in the third season of the national league, in 1968. Pacers returned to the national league in 1999 competing in Division I, i.e. the 2nd Level Men's Division. Most importantly, they captured and brought home the Division I Play-Off Championship trophy to their village that year. A sports story published in the Tropical Star of Wednesday 7th July 1999 was simply titled, 'Pacers, Renegades are Champs'. Paragraph 1 of that item read, "New champions have been crowned in Divisions I and II of the 1999 Sprite Basketball League". The story further stated, "D-Supply Pacers who lost their first match with Bakers Pride X-Men played brilliant, determined basketball to win the Division I championship from X-Men". The article continued, "Pacers mental advantage seemed to sweep them on in their third and final game with X-Men last Friday evening, dominating the first half 36-21. X-Men breathed deeply and came back firing in the second half, but could not deny Pacers their own runs on their way to a 73-65 points win. "Ted George, former national and Knicks championship player was key to Pacers success with 28 points ably supported by captain Levi Baron and Jason Jno. Jules 13." Pacers then got promoted to the Premier Division in 2000 after capturing the Division I championship the year before. In one of their 2000 Regular League games, Pacers were defeated by Blazers 88-67, with Levi Baron sinking in 26 Pts and Jason Jno. Jules 12. Some years later Pacers exited from the national league. During their lifetime Pacers were coached during different periods by basketballers from Grand Bay. Stephen "Homo" Bellot (now deceased), John Roach, Sylvester Daniel and Francis Letang were the men who held the clipboard with Pichelin's Pacers. Subsequently, Pichelin fielded a reformed team called Bulls Eye PISTONS which competed in Division I and remained at that level until 2011. The following year, i.e. 2012, Pichelin's representative team underwent another name change, this time to FALCONS, and they first competed in Division I (2nd Level Men's Division) of DABA's national league. That year Falcons snatched the Division I Regular League Championship and also bagged the Best Defensive Team and Best Offensive Team Awards. Son-of-the-soil and former Pacers player Levi Baron served as the team's Coach. In 2013 Falcons were one of 8 teams competing for championship honours in the 2nd Level Men's Division. They ended the season with 5 Wins, 1 Loss, aggregate-scores of 610 Pts, and 499 conceded points. But most importantly, they captured the 2013 Division I National Play-Off Championship!